When you stay at Unryuso in Shinshiro, you'll be 5 minutes by foot from Horaijisan Natural Science Museum. Free self parking is available onsite. With a stay at Hotel Tetora Yunokawaonsen in Hakodate, you'll be within a 10-minute walk of Yunokawa Onsen and Hakodate Tropical Botanical Garden. Free self parking is available onsite. 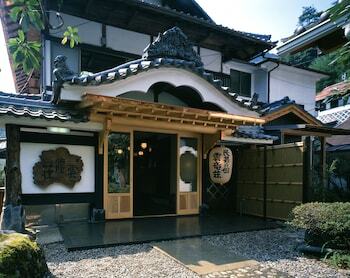 Located in Kyoto, Prinz is within a 15-minute drive of Kyoto Imperial Palace and Heian Shrine. The front desk is staffed during limited hours. Free self parking is available onsite. With a stay at this vacation home in Kyoto, you'll be a 3-minute drive from Sanjusangendo Temple and 7 minutes from Kyoto Tower. With a stay at this vacation home in Kyoto, you'll be a 1-minute drive from Fushimi Inari Shrine and 10 minutes from Sanjusangendo Temple. With a stay at Hotel Route-Inn Yurihonjyo in Yurihonjo, you'll be within a 10-minute drive of Honjo Park and Saiya Sake Brewery. Free self parking is available onsite. With a stay at Furano Shiyuirin in Kamifurano, you'll be just steps from Blue Pond and Tokachidake Onsen. The front desk is staffed during limited hours. Free self parking is available onsite. With a stay at Zeus The Garden in Osaka (Namba), you'll be a 3-minute drive from Tsutenkaku Tower and 9 minutes from Osaka Science Museum.